Most of what you’ll find at our sales is already 20-80% less than retail, but by taking advantage of these promotions you’ll save even more! Text “shopatg” (no spaces) to 64600 for special promotions and coupons. ATG Buck$ are “good as cash” for shopping at our upcoming sales event. $cha-ching$! Tell the people you are referring that when they register as a consignor online they need to select “Other” in the “How Did You Hear About Us” field and then enter your name in the “Other:” field. Referrals will be credited to the referring person’s name that is entered at the time of registration only. One referral credit per new consignor. 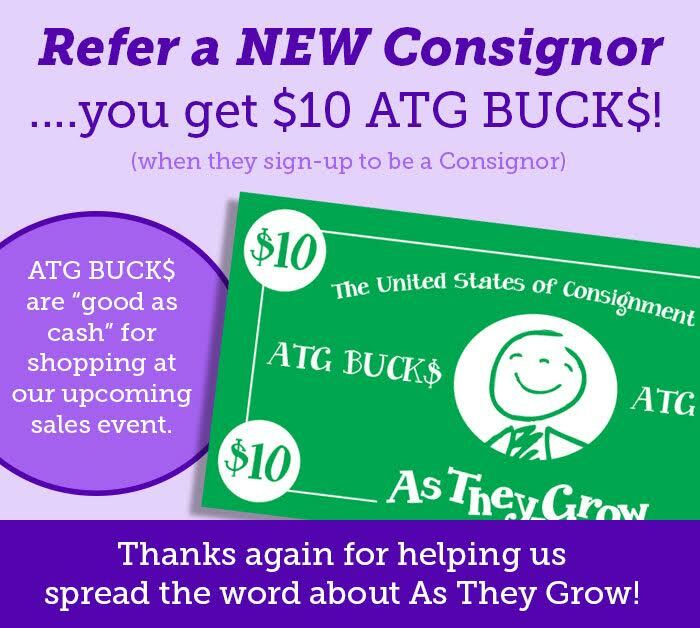 For example, if two people tell a new consignor about ATG, only the person whose name is entered as a referral source will be credited the 10 ATG Buck$. Entering more than one name as a referral source will void referral credit. Pick up your ATG Buck$ at Checkout during the sale. Follow us on Facebook at www.Facebook.com/AsTheyGrowLV and Instagram at www.Instagram.com/AsTheyGrowSale for real-time sale updates and juicy giveaways. Turn Your Kid Clutter Into Ca$h! Consignors earn 65-70% of what their items sell for -and- consignors who volunteer for 2 or more work shifts keep 70%! We reach thousands of shoppers in a single weekend so you don’t have to! Pay to shop first & help a charity! Purchase a VIP ticket to shop on Tuesday before we open to the public. Shop early for better selection & prices. 100% of ticket proceeds donated to one of our local charity partners. Want to shop early, for best prices & selection? Not a consignor or volunteer? Don’t worry, you have options for getting in early. Get first dibs on our great selection of new & gently-loved baby & kids items by shopping early at one of our PreSales! As They Grow is the largest & longest-running kids’ consignment sale in Nevada, serving the Las Vegas community since 2009. Owned by 3 local moms, we have 4 sale events per year, held in the Spring & Fall in various locations – like a pop-up! We make turning your kid clutter into cash easy. We do all the advertising, set -up, selling and clean-up at a large, one-weekend event and mail you a check afterwards. We strive to provide quality new & gently-loved baby & children’s goods to families all under one, organized roof – for a fraction of retail. We invite you to shop, consign and save with us at our next consignment sale event!